You can sign in to iCloud using Apple account. 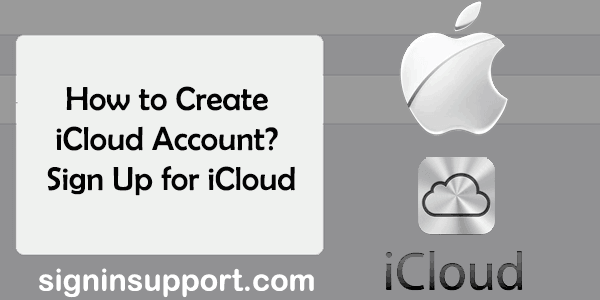 You don’t need to create a separate account to sign in to iCloud account. We have a detailed article on ‘how to create Apple ID.’ In this post, we are going to guide you on creating a new @iCloud email account. Making a free iCloud email account is an easy process and can be completed within a few minutes. But you can’t sign up for iCloud using PC or Android; you need to use either iOS or Mac OS. Open ‘Settings’ app on your iPhone or Mac. Scroll down and tap on the option ‘iCloud’. At the bottom of the sign in page, there is ‘Create a new Apple ID’ option. Tap on that link. Enter your date of birth and full name. Select the option ‘Get a free iCloud email address’. Create the username you want. That will be your new Apple ID. If the username you want isn’t available, try another. Make a strong password. Mix uppercase & lowercase alphabets and numbers while creating the password. Select three security questions and answer them. These security questions will be helpful in resetting the password. Congratulations, you’ve successfully created an iCloud email account. If you already have an Apple ID but don’t have a @iCloud email account, then follow the process below. Open ‘Settings’ from the iPhone menu or Mac. Tap on the ‘iCloud’ option. Turn on ‘Mail’ option by touching the side slide. A pop-up window will appear with notification ‘Create a free @iCloud.com email address to turn on iCloud Mail.’ Tap on ‘Create’. Enter the username you want to use as a @iCloud email address. Be careful while selecting a username as you can’t change it later. Click ‘Next’, and if the username you’ve chosen is available, your iCloud email account is created. If you have any queries or problems regarding iCloud sign up, please let us know in the comment section below. what is the problem you are facing while logging in? 1. Connect to internet with WiFi network. 3. Tap General and go to ‘Software update’. You can tap update now or postpone until later. Similarly, you can update iOS using iTunes account. For more details follow https://support.apple.com/en-in/HT204204 here. Have an I tunes account, most things were ok. I cloud comes along, now , not only am I locked out of most of my music, I cloud says my user name, and ID are wrong. Can’t seem to link the two.